Extra Music Pack For Skyrim contains 28 new tunes for Skyrim to give more robust experience without taking away from the original experience. All of the tunes have been composed by me, finnish composer Matti Paalanen. Optional 1.3 update live with more battle and dungeon tunes. As I am not sure if all people like to have them included, I uploaded it as an optional. Download it if you like. Official is still the same 28 tune version. It has come to my attention that this might prevent Dawnguard DLC music from being played in the playlists. There is optional 1.2 version in the files that is created against Dawnguard. I recommend downloading it if you run Dawnguard and 1.1 if you run vanilla. Extra Music Pack For Skyrim contains 28 new tunes for Skyrim to give more robust experience without taking away from the original experience. Original soundtrack is left as it is, new tunes are just added to some of the playlists. All of the tunes have been composed by me, finnish composer Matti Paalanen under project name Celestial Aeon Project. 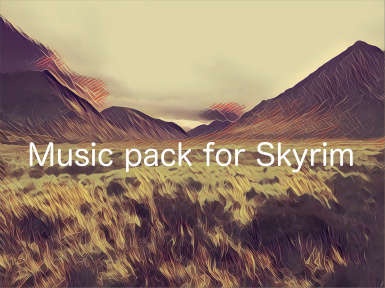 I published some of my music as Oblivion music packs back in the day and they got really good response, so I think this pack will gain some popularity in Skyrim as well. If you are interested, just let me know and I can create more packs for Skyrim as well. This music adds extra music without touching the original soundtrack at all. It injects some tunes to the playlists of outdoors, towns, inns and battles. The extra music files will reside in Data/Music folder that should be empty in vanilla Skyrim. Just unpack the zip to the Data folder in your Skyrim directory. It will extract the plugin file and all the wav files under Music folder. Only problem might arise if some other music packs happen to have same filenames, then this pack is not compatible with your current addons and you shouldn't use this. If you find that some tunes won't fit in and you don't want to edit the actual file in Skyrim Editor, you can replace the actual .WAV files in the Music folder with something else. If you keep the names intact, the mod will work as it is. You can either use some .WAV files from the mod itself by just copying and renaming them or use your own .WAV files. Just check what wav files are included in the zip and delete them from the Data/Music subfolder of your Skyrim installation. 2) you can leave the tag as it is and support me through the ad income and make me a happy composer!